"On the last day of shooting his beloved dachshund pup Ciao, which he bought in Italy, suddenly died - which was one straw too many. A local socialite, Gilda Dahlberg, had planned a large cocktail party in Alan's honor, and he was finally persuaded to make a brief appearance, even if two hours late. Broadway columnist Earl Wilson, in Rome at the time and a guest at the party, recalls Alan mournfully telling him, 'Never fall in love' (with a dog). "Back in Los Angeles on April 1, he told Hedda Hopper, 'This has taught me a lesson. I'll only make pictures abroad for major American companies, but I'd rather make them here.' Hedda further reported that Alan had not yet received compensation for the picture, though the money was being cleared through an Italian bank, and that he had given the company an extra week without pay so they could finish the picture. 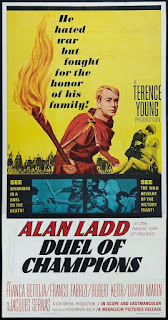 "Medallion, however, still found no buyers, and six months later, in February 1965, Allen Eyles' review in Films and Filming made sure the movie would never be bought. 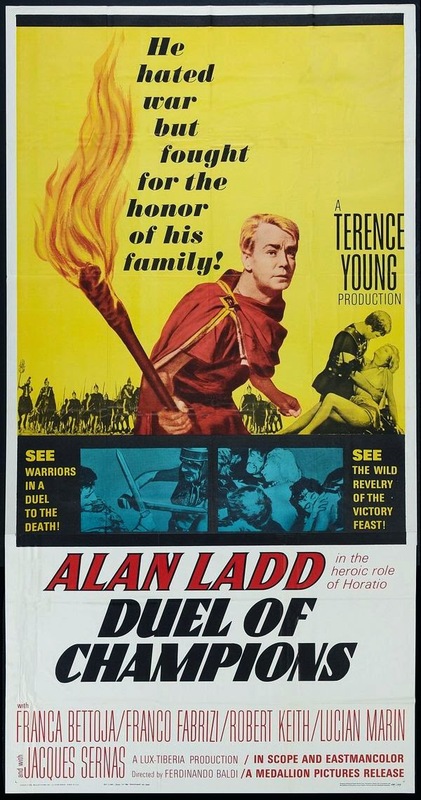 Eyles wrote that '...[the] film is a thoroughly indifferent spectacle, and there is little pleasure in watching [Alan Ladd] rather spent and ill-at-ease, reduced to playing a part for which he is many years too old in a setting that is cheap and familiar.' After this, DUEL OF CHAMPIONS vanished forever. It would not even be considered fodder for the 'Late Late Show' at three o'clock in the morning. However, Alan would be mercifully spared this knowledge..."